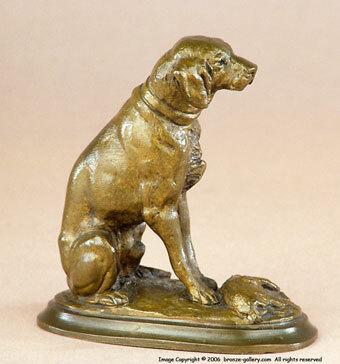 Many of the Animaliers produced small minature bronzes which were quite detailed. Sadly most of them are lost today since Animalier bronzes went out of favor for some years and these miniatures were either thrown out or given to children as toys. Today they are quite sought after and collected in their own right. 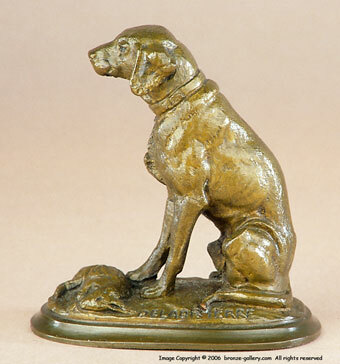 Delabrierre did several hunting dogs in miniature, and this is a Pointer or a Hound with a Hare at his feet. For such a small bronze, it has plenty of detail and is finished in a mid brown patina. A rare miniature and a nice addition to any collection.